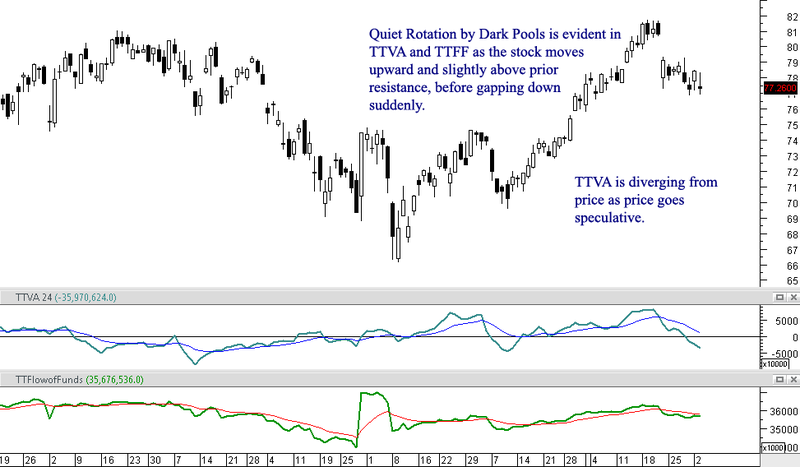 Dark Pool Quiet Rotation Patterns™ are here to stay, despite what the retail news media hype portends. The Securities and Exchange Commission SEC has investigated the practices of giant Buy Side Institutions using Dark Pools, and it has been proven that they are not getting any price advantage. Dark Pools are used to hide giant lot orders by Buy Side Institutions, and to ensure when the giant lot orders are triggering there is no major disruption of the current trend. If you are new to trading, this is critical information to learn. If you traded during the 1990’s and before 2005, then this is even more important. It is a major Market Structure change that has altered everything you would have learned previously about trading stocks, and continues to change price and volume patterns today. Most traders learn “Accumulation and Distribution” patterns, which are broad terms not clearly defined. Unfortunately QUIET is very different now with Alternative Trading Systems ATS venues. The term “quiet” means it is not visible in the chart, unless you use specific indicators and KNOW what to look for in price action. Many Retail Traders are prone to sticking with outdated Methodologies, Strategies, and Trading Systems so it is a leap of faith for them to accept the new reality of stock trading. However until you learn the Dark Pool patterns, trading profits are likely to be a disappointment or if you are just trading as a hobby then you may be content with breaking even. Remember to truly calculate profitability, you have to include your time as an hourly wage expense for Trading as a Business. Today we are studying Dark Pool Quiet Rotation Patterns, which differ from Quiet Distribution Patterns. The term Quiet Distribution refers to a mandatory selling of shares of stock held in trusts and charters. Giant Funds Managers of Buy Side Institutions do not wish to sell the stock, but are forced to do so based on sudden huge redemption demands by their uninformed Mutual Fund Investors. Distribution dumps a huge amount of stock for sale suddenly, removing money from the Stock Market so there is an outflow of monies aka funds. The TechniTrader Volume Accumulation TTVA which is a Volume Oscillator in the middle chart window clearly reveals a contrarian Volume pattern, or that Volume is heavier on the sell side than on the buy side. The TechniTrader Flow of Funds TTFF Indicator in the bottom chart window, reveals that the flow of money into this stock is not keeping up with the fast pace of the Retail Traders and the Smaller Funds. Both of these Market Participant Groups trade like they belong on the retail side of the market, rather than on the professional side. The giant Buy Side Institutions use these two Market Participant Groups as a cloak to hide their Dark Pool Quiet Rotation Patterns. By not disturbing the trend but allowing the stock to climb higher due to retail trading and smaller fund buying patterns, the Dark Pools actually benefit as they sell hidden on their ATS venues. 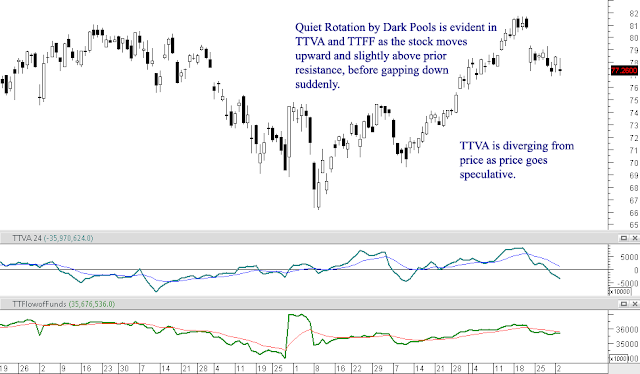 TTVA the Volume Oscillator, starts heading down and diverging contrarily from the price action which is a critical point all traders need to recognize. Sure you can trade the stock as it moves up, however if you are not aware of the heavy Quiet Rotation out of this stock, a buy could end up being a serious major loss. This stock gapped down after barely rising above prior resistance. TTFF lags behind price, which is moving with speculative emotional buying by smaller lots. Go to TechniTrader.com Learning Center for more information about Dark Pools HERE.